Can anyone tell me how to plot a best fit great circle for a large data set of joint planes? the "best fit great circle" option in the stereonet utility only plots a best fit girdle to the pole to the planes, NOT to a best fit great circle for all of the plane's great circles..plus the help and instructions doin't provide any description on how to do this. Does anyone know i it is possible to do this? I don't even see a way to manually draw my own best fit great circle. I basically have two joint sets that I want to generate a best fit great circle for eaach joint set. I don't want a best fit great circle for the pole! I have attached an example. 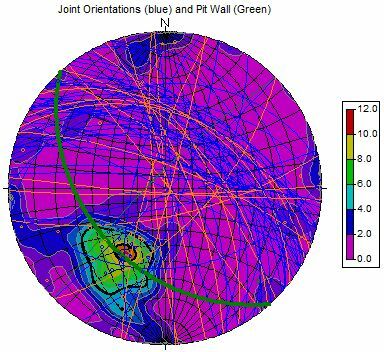 the thick green line is what rockworks calls the best fit great circle, and as one can see, it is a best fit circle to the poles, not the other great circles. I cannot see a way to draw a best fit for the great circles. I will add your request for this feature to the suggestion file.